In my last post, I mentioned how much I like the look of a short and stubby aircraft. I wouldn’t go as far as to call it a weird fetish or anything (lol), but short and squat proportions help to exaggerate the impression of power and strength – which isn’t necessarily a bad thing for an airplane to convey. I don’t know about you, but I’m not about to step foot on any airplane that looks weak and flimsy. The Airbus A310 is a perfect example of an airplane that just looks tough. Oddly enough, it’s predecessor (the A300) didn’t look anywhere near as tough as this thing does. Despite it’s tough outer appearance, I’ve always considered the Airbus A310 to be an oddball commercial airliner. It’s proportions are bordering on being somewhat cartoonish due to it’s extreme stubbiness, and I almost feel the urge to snicker whenever I see one. But then again, the A310 has always been a rare aircraft here in the US and I haven’t seen many in real life. 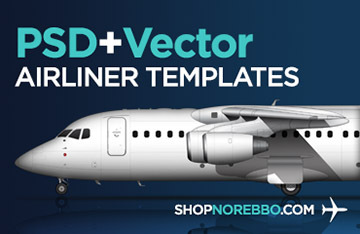 Just so you know, adding this oddball to my side view airliner template collection was completely unplanned – I only created it because of a request I received from a reader pretty much right at the exact moment I was contemplating which airplane I should draw next. I couldn’t make up my mind, but the request sounded pretty desperate and I’m always happy to oblige provided I have the time. It hardly ever works that way with my busy schedule, but I’m glad I could fulfill this request in a (somewhat) timely manner. Finally, I’d like to point out that comparing the visual differences between the A350-800 to this A310 has been interesting as I’ve been creating these illustrations. 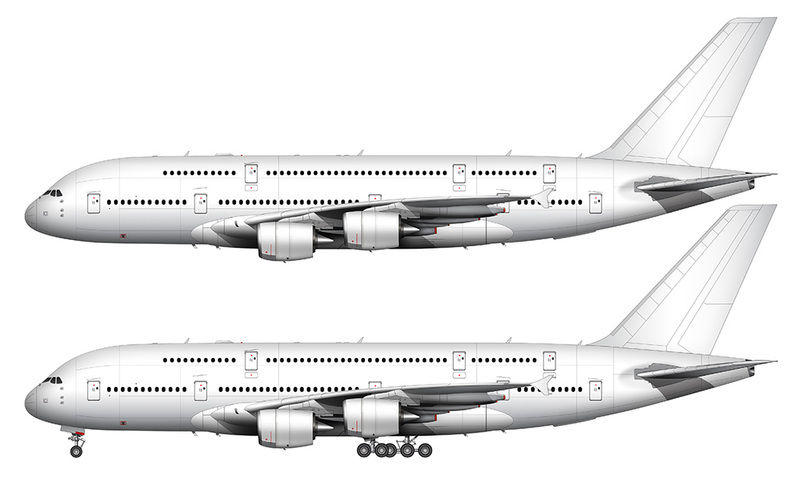 They are essentially the same class of airplanes, with nearly 30 years of technology separating the two. 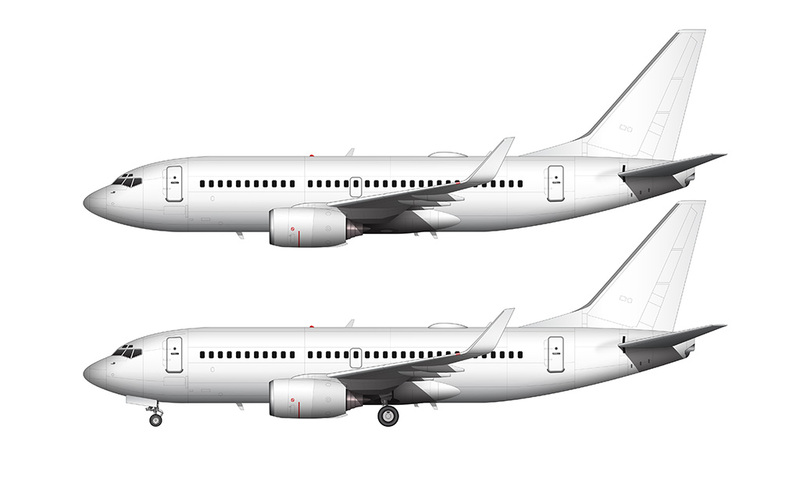 The fuselage of the A310 is almost boat-like in shape with it’s high nose and tail, while the A350 has a much lower belt line. The wings of the A350 are much more aggresively shaped compared to the A310, and I find it interesting how the vertical stabilizers vary greatly in size. 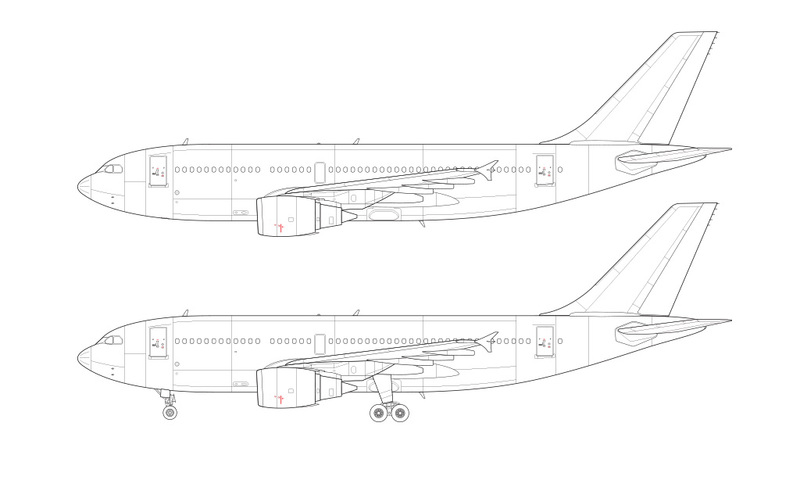 The A310 vertical stabilizer is downright huge in comparison to it’s fuselage, while the A350 has opposite proportions. One of my all time favourite planes along with the 747 SP – I fondly remember flying on a Wardair A310 when I was young which looked perfect and seeing B-Cal ones at Gatwick. I’m not sure what the short stubby thing is about but I too really like it – makes it look powerful and heavier , it was like the underdog or new kid on the block compared to the more recognisable jumbos. I totally agree – big airplanes are fun to watch, but it’s the little guys (with big engines) that look the toughest!